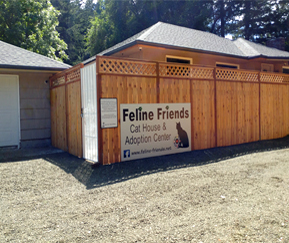 Feline Friends is a non profit 501(c)(3) organization serving Thurston and Mason counties. We're staffed by dedicated volunteers partnering to rescue stray cats and kittens. We strongly encourage spay and neuter of all companion animals to reduce and eventually eliminate the unnecessary killing and abandonment of unwanted pets. Feline Friends rescues stray cats and kittens based on our available resources. If you need help with a stray cat or kitten, please complete the intake form that best describes your situation. Intake forms can be found by Clicking Here.